This tester can be used as a digital brake fluid tester suitable for determining brake fluid quality. Developed for professional use in automotive repair shops. The quality of the brake fluid can be tested on five LEDs in terms of “Percentage of water in the brake fluid. Quality it tested and indicated on five LEDs in terms of per cent of water in the brake fluid. Press the button for Power ON, Green LED will light up. 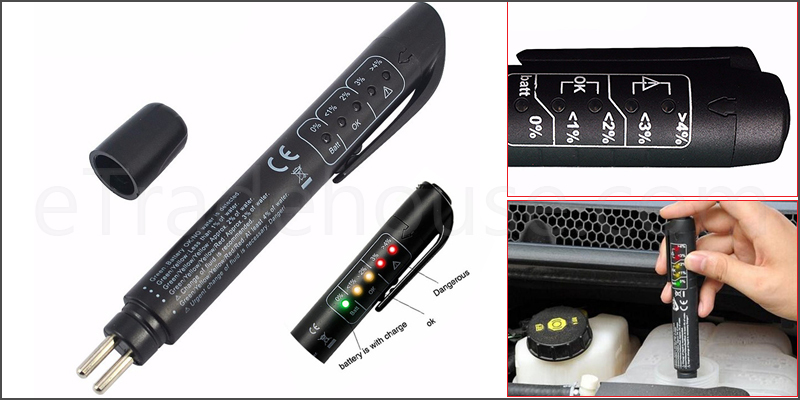 Insert the tester into reservoir for one second then the test result will be indicated by LEDs. The tester will automatically power off after 12 seconds of inactivity. Green: 0% Water. Battery OK, no water contained in the brake fluid. Yellow/Yellow: 2% Water. Still OK to Use. Yellow/Yellow/Red: 3% of Water. Thebrake fluid should be changed. Yellow/Yellow/Red/Red: At least 4% of Water. The brake fluid must be changed urgently!